Please join Iranian American Society of New York, Inc. (IAS) in celebrating Nowruz Gala 1398 with Persian music legend SHAHRAM SHABPAREH. This year's event will be one of a kind and you won't want to miss out on all the fun and festivities with friends and family. This year's prestigious "The Dr. Hooshang Mirlohi Legends Award" Honoree will be the late Dr. Reza Hedayati, our distinguished community leader, past-President and physician who promoted the Persian culture, language and the arts through his many activities for over the past 30 years. The evening will include Hors d'oeuvre hour, dinner, dessert, open bar all evening and dancing. All Tickets are $175 per person if purchased by February 10, 2019, and $195 per person thereafter. VIP seating will be $225 per person and special discount available for tables of 10-12. ALL PROCEEDS WILL GO TOWARDS IAS Persian Community Center (IASPCC). For info and tickets, please contact us at (866)767-6498. Tickets also available at Super Jordan. We also thank our Platinum Sponsor Ravagh Persian Grill for their continued support. For sponsorship information and ads for the Nowruz Journal please email us at info@iasnewyork.org. All Sponsorship/Ad donations are tax-deductible and all proceeds will go towards IAS Persian Community Center (IASPCC). Please show your support for our friends at Daricheh Cinema and IFC Center and join us at this remarkable event starting tomorrow. PIG: Monday, January 14th at 9:30p.m. Sheeple: Tuesday, January 15th at 9:30p.m. This Film Festival presents a selection of acclaimed and award-winning films from one of the world’s most vital and distinguished national cinemas. The Festival aims to unite two strands of Iranian moviemaking – the classic art-house Iranian cinema beloved by cinephiles around the world, and new cutting-edge works that showcase the adventurousness and daring nature of younger Iranian directors. Please arrive earlier and try your best to car pool to reduce traffic for the management of the valet parking. In lieu of flowers, The Hedayati Family respectfully requests that you donate directly to the Iranian American Society of New York, Inc. (IAS). Thank you. Hands-on fun for the whole family inspired by the Persian New Year Festival Nowruz! Organized in collaboration with The Ferdowsi School of Westchester. FREE ADMISSION made possible through the generous support of Linda Levine and her family. Please join Iranian American Society of New York, Inc. (IAS) in celebrating Nowruz Gala 1397 with Persian music legend ANDY. This year's event will be one of a kind and you won't want to miss out on all the fun and festivities with friends and family. This year's prestigious "The Hooshang Mirlohi Legends Award" Honoree will be the distinguished Iranian American NASA Scientist, DR. FIROUZ NADERI. ALL PROCEEDS WILL GO TOWARDS IAS FERDOWSI SCHOOLS OF LONG ISLAND AND WESTCHESTER (Persian/Farsi language and arts classes). Tickets for this event are $170 per person if tickets purchased and payment received by February 1, 2018. Otherwise, tickets are $180 per person. Please contact us for special table discounts for tables of 12. We also thank our Platinum Sponsor Ravagh Persian Grill. For sponsorship information and ads for the Nowruz Journal please email us at info@iasnewyork.org. All Sponsorship/Ad donations are tax-deductible and all proceeds will go towards IAS Ferdowsi Schools of Long Island and Westchester. Please join IAS for its 36th Annual General Meeting and Election of the Board of Directors for 2018 at Marriott Hotel in Uniondale, New York. The key note speaker at this year's meeting is Mr. Matin Rahmani, The Funding Partner at First Manhattan Financial. Below are some of the topics that will be covered. *Are Your Year-End Tax Strategies in Place? *Online Trading or Hiring an Investment Advisor? Registration starts at 11:30a.m., followed by a luncheon, Introduction of Speaker, Q/A and Election of the new IAS Board of Directors for the available directorships. ADMISSION: Free for IAS Members, $40.00 for non-Members. 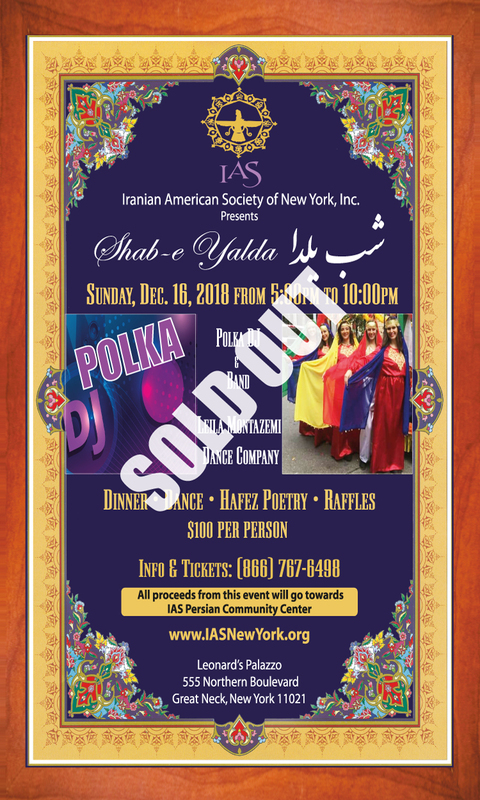 Come join Iranian American Society of New York, Inc. (IAS) at their annual Shab-e Yalda festivities with appetizers and dinner from Ravagh Persian Grill, entertainment by DJ Atash, Hafez Poetry, and a special dance performance "Dance of Persia" by Leila Montazemi and ensemble. Tickets for this event are available by calling (866) 767-6498 and are $75 per person (non-members) and $65 per person (IAS members). We would like to thank Super Jordan in Syosset, New York for selling tickets to the Bijan Mortazavi concert on Saturday, September 16, 2017, in support of the IAS Ferdowsi Schools of Long Island and Westchester. They will donate 50% of the general admission ticket proceeds if you mention the Promo Code FERDOWSI2017. General Admission tickets are $50 per person and as such $25 per ticket will be a donation to our Persian/Farsi language and cultural classes. Please note again to use the Promo Code FERDOWSI2017. We thank everyone for your anticipated support. It’s time to register for IAS Ferdowsi Farsi language and cultural classes for the 2017-2018 school year. Classes include beginner, intermediate and advance levels for children and adults. Iranian American Society of New York, Inc. THE LAW OFFICES OF M. RAY ARVAND, P.C. Note: Your paid receipt is your ticket. After checkout, please print your receipt and bring to the event as proof of purchase. Please join IAS in celebrating Nowruz Gala 1396 with SHAHRAM & SHOHREH SOLATI. This year's event will be one of a kind and you won't want to miss out on all the fun and festivities with friends and family. Further, the recipient of The Hooshang Mirlohi Legends Award will be distinguished Iranian artist Nicky Nodjoumi. The evening will include Hors d'oeuvre hour, dinner, dessert, open bar all evening and dancing. 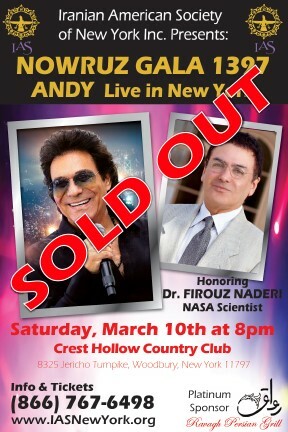 ALL PROCEEDS WILL GO TOWARDS IAS FERDOWSI SCHOOLS OF LONG ISLAND AND WESTCHESTER (Farsi language and arts classes). Tickets for this event are $175 per person. Please contact us for special table discount for tables of 12 (for IAS members ONLY). Iranian American Society of New York, Inc. (IAS) proudly presents an evening to assist our community with the recent travel ban imposed by the Executive Orders of President Trump. Please join our panel of attorneys and experts in educating the public and answering some of your most important questions about your future here in the United States and how to approach the many challenges that members of our community face. All are welcome! Come join Iranian American Society of New York, Inc. (IAS) as we celebrate Shab-e Yalda (longest night of the year) with our friends and supporters with Dinner, Dancing (DJ), and Hafez poetry. For tickets and info, please call (866) 767-6498. The Nasser Sharify Foundation and The Iranian-American Society of New York Foundation are pleased to announce, in honor of Dr. Nasser Sharify and with the support of the Nasser Sharify Foundation, we are holding an "Excellence in Poetry" Contest. The contest will consist of three awards in the amount of $500 each in three categories. New movie opening in New York on May 20th: Maz Jobrani is "Jimmy Vestvood: Amerikan Hero." Iranian American Society of New York, Inc. (IAS) proudly presents KAMRAN & HOOMAN for this year's Nowruz Gala celebration sponsored by Ravagh Persian Grill. Further, we are honoring the great DR. KAVEH ALIZADEH, Plastic Surgeon & Humanitarian, for his great work throughout the world. This Nowruz Gala will be one to remember and will include hors d'oeuvre hour, full-course dinner, open bar for the entire evening and dancing all night. For information and tickets, please call (866) 767-6498.